If you're going upland bird hunting or clay target shooting, grab this 250-shell case of 12 gauge ammunition from Estate. These shells deliver solid performance at a reasonable price. Each shell in this case packs an ounce of #8 birdshot into a 2-3/4 hull, firing it at a muzzle velocity of 1,290 feet per second. 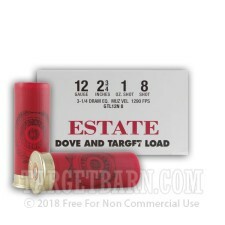 This is a relatively high velocity for a birdshot load, and it results in tighter patterns and greater terminal effectiveness. 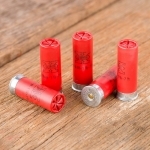 Estate shotshells are loaded by Federal Premium Ammunition of Anoka, Minnesota.